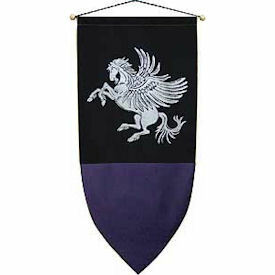 The winged horse of Greek mythology , Pegasus, is emblazoned in glistening silver in the black top background of this heraldic banner, which is accented by the royal purple bottom section. Add some royal decor to your own home! 48" high x 22.5" wide. Includes kit for hanging.